Located in South Kansas City. Conveniently located by Downtown. Take a refreshing dip in our Indoor/Outdoor Pool. Board room available up to 270 attendees and 7,100 square feet . Cable TV, Hair Dryer, Fridge, Microwave, Desk, and Coffee Maker. Welcome to Best Host Inn Plaza Kansas City South. Our newly renovated and updated hotel is located just off Hwy 71 with easy access to business, 1.5 miles from IHOP, shopping and local attractions. 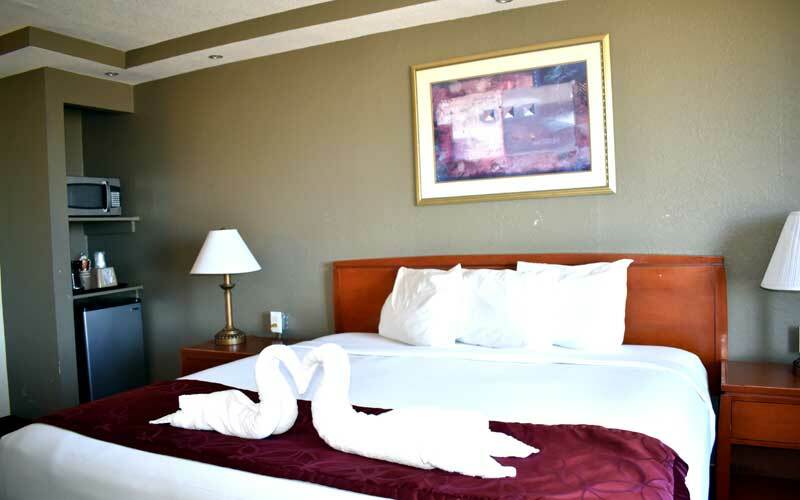 Best Host Inn Plaza KC South hotel offers 126 guest rooms featured newly renovated rooms with custom furniture. For those who prefer more comfortable and upscale settings choices. Both come with microwave oven and refrigerator. Our banquet facilities were designed to meet all your conference and meeting needs, we have up to 7100 square feet space which offer maximum flexibility for all occasions, both large and small and everything in between to complement the business traveler, there is an onsite Business Center with free Internet and e-mail access in the main lobby area for your convenience. The leisure traveler will take pleasure in our unique indoor/outdoor swimming pool. There is also a spacious fitness centre to keep you in shape when away from home. Be it a reception for 270 attendees or just a private board meeting for 10, there is always room for any occasion. Full banquet service including catering is available. Activities : Home to many of Missouri's spring-fed streams and crystal clear waters, Missouri truly is a haven for nature lovers. The extreme southeastern corner, known as the “Bootheel” because of its shape, is rich in Missouri history and agriculture. Airport : The Kansas City Aviation Department owns and operates Kansas City International Airport and Charles B. Wheeler Downtown Airport. The Aviation Department's mission is to provide outstanding airport services in a safe and cost-effective manner for the benefit of citizens, visitors, airlines and customers. Attractions : Kansas City attractions offer an endless variety of things to see and do. Explore the only nationally-recognized museum dedicated to World War I. Let curiosity guide you at Union Station. Casinos : Experience Las Vegas style gaming located just minutes from the Kansas City International Airport and downtown Kansas City. Dining : Enjoy Kansas City restaurants. Kansas City is famous for its culinary delights. The legend of Kansas City barbecue. The taste of a Kansas City steak. Golf : Looking for a Fun Golf Experience? Discover Missouri's Best Golf Today! Hospitals : Childrens Mercy Hospital At Children's Mercy Hospitals and Clinics, we are redefining pediatric medicine throughout the Midwest and beyond. Shopping : Kansas City truly is a shopaholics paradise--even the first outdoor shopping mall started here! These top shopping areas showcase some of Kansas City's most fabulous stores. Sports : Kansas City Royals. Tickets as low as $7 each with a Royals Season Ticket Plan. Hours: Visit www.royals.com for game times & Box Office Hours. "Preferred Rates For Our Hotel Guests"